Slice n' Dice - The Samurai are in Action! Only quite literally moments after taking delivery of a 15mm painted Samurai army from Lurkio (which you have already probably seen on this site) himself, the brave guys (and their probably less enthusiastic cattle) were placed immediately onto the table and pitched straight into a series of brutal battles at Burton Doubles 2018. This resulted in a fiercely contested Samurai Civil War, two invasions of Europe which saw the Japanese warriors pit their katanas against the historically contemporary bearded axes and knightly lances of the English & Irish, and a return to South Asia for a final showdown with the Elephant Kingdom of the Tamils. All 4 battles have their own unique write-ups, and this time also come with dedicated Podcasts (available in both Video and Audio formats), either of which will provide you with a running commentary on what approximated for the "thinking" of the two joint Samurai commanders. The full Samurai spectrum of photos, captions and Hannibal analysis is also - as usual - provided for your delight and despair! A near-unique event today, as I post pictures of an army that I haven't painted myself... but don't worry, the usual bog-standard finishing is then in evidence with some bodged-together and over ambitious terrain ! 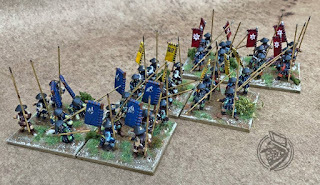 The army is a 15mm Samurai force for L'Art de la Guerre. 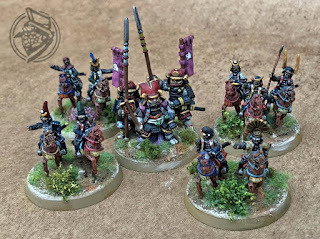 Mostly composed of Old Glory figures from Timecast, they are supplemented with a handful of Baueda Emeshi cavalry and a Dixon 28mm Great Commander. The Samurai Village has already been posted online but this time there is also a self-made "ADLG Waterway" Samurai Castle wall to marvel at the amount of spare time I have to do stuff other than paint figures ! The Walls come with a walk-through construction guide as well. Meet The Spartans as they meet Persians, Dominate Romans, Selukids and Graeco Bactrians in 4 full action match reports - with added Hannibal and Leonidas as well!